This popular day hike features excellent, 360 degree, panoramic views from the lookout. The trail starts from Dunraven Pass on an old road that provides a nice gradual grade the entire way up. The trail snakes along the alpine ridges giving you views southward toward the Canyon Area. Trees break up the grassy slopes, but decrease as you gain elevation and the terrain becomes more rocky. The trail switchbacks a few times with the last switchback providing fantastic views south. The trail turns north and runs along the rocky ridge with the lookout clearly in sight. 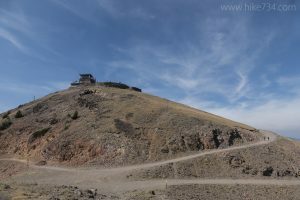 The trail joins up with the two other routes to the top, then wraps around the summit, ending at the large parking lot with the lookout. An interpretive area and restroom are located inside the lookout. Resident bighorn sheep frequent the surrounding grassy slopes. An alternative, shorter route up to the lookout is via the Chittenden Road. This route is 5.8mi/9.3km round trip and gains an additional 100ft/30m. It offers more views to the north on the way up as it wanders up a grassy ridgeline. Another way down from Mount Washburn is to head east on the trail at the junction just below the lookout. This trail traverses along a ridgeline before steeply dropping to the valley below. This alternate route heads to the Canyon Area at the Glacial Boulder, 8.5mi/13.4km from the summit and requires arranging a car shuttle. 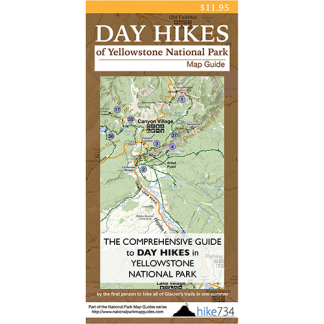 Trailhead: The signed parking lot for Mount Washburn is located at Dunraven Pass north of Canyon Village. The trailhead for Chittenden Road route is north of Dunraven Pass. Follow the signed, dirt Chittenden Road to the parking lot.